Our kickboxing muay thai schedule was a bit unwieldy with 45 minute and one hour classes. So we simplified it, effective Monday. All classes are now one hour. The big change – the late class on Mon. and Wed. now starts at 7:30. Mon. and Wed. classes are 5:30, 6:30, and 7:30. Tue and Thur classes are 5:30 and 6:30. Fri. continues to be at 5 and Saturday is still at 12. See the new schedule. TODAY! Jay’s Kickboxing and Texas Karate Institute (TKI) invite you to our Customer Appreciation Holiday Party Friday Dec 19th at 7 pm. There will be food, awards, demonstrations, and fun. It’s Jay’s Kickboxing one year anniversary at TKI. We hope to see you there! TOMORROW. Join us for Muay Thai Saturday at noon. Take your training to next level. The class focuses on more advanced techniques and includes light sparring, depending on attendees. 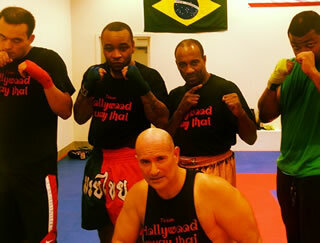 It will be the last Muay Thai class until Jan 10th. NEXT TWO WEEKS. The studio will be closed Wednesday through Saturday the next two weeks for the holidays. So we’ll just have class Monday and Tuesday those two weeks. Effective today, on Fridays we will have one class for Muay Thai Fitness from 5-6pm. If you can’t make that, we remind you that we have a Muay Thai class Saturdays at 12-1pm. Visit our Schedule page for more classes and our location in Richardson.